Download the LimoWiz set up program from the members page at limowiz.com, then install. Click on Backup icon top Toolbar. 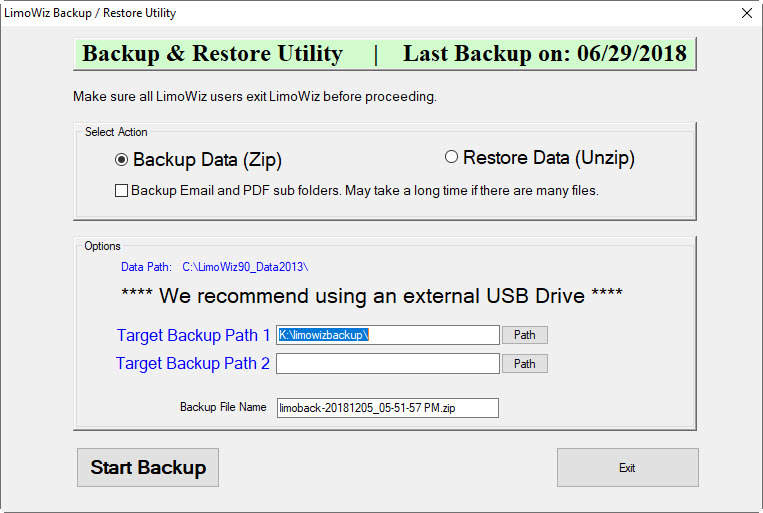 Note: Before doing backup or restore, all windows in LimoWiz must be closed. On a network, all users must exit LimoWiz. Click Backup Data radio button. Select Target Backup Path 1: this where the LimoWiz data will be backed to; this must be a valid drive and folder. Target Backup Path 2 is optional. The backup file name is automatically selected based on the date of backup. You may change it if you wish. A message is displayed telling where LimoWiz Data will be backed up. A "Backup Complete" message will appear after backup is completed. Make sure backup status reaches 100%.